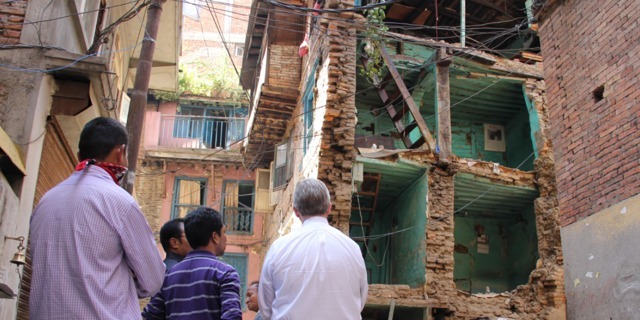 KATHMANDU, Nepal—Jehovah’s Witnesses from Bangladesh, Germany, India, Japan, Switzerland, and the United States are coordinating their efforts to help victims of the devastating earthquake that hit Nepal on April 25, 2015, and killed thousands, including one Witness and her two children. A second quake hit Nepal on May 12, 2015. However, the Witnesses confirm that, in this latest earthquake, none of their members suffered major injuries, severe damage to their property, or loss of life. Jehovah’s Witnesses provide food for fellow worshippers and other disaster victims twice a day. The day after the first quake, representatives from the Nepal office of Jehovah’s Witnesses visited each congregation in Kathmandu Valley, an area hard hit by the quake, to assess the needs of the victims. The quake had destroyed 38 of the Witnesses’ homes and damaged 126 others. Those displaced were given shelter in the homes of fellow worshippers, in their places of worship called Kingdom Halls, and in tents set up in open areas. The Nepal office also began supplying food, which was soon augmented by supplies from Bangladesh, India, and the Nepali cities of Birgunj, Damauli, Mahendranagar, and Pokhara. A Disaster Relief Committee is coordinating the ongoing efforts of Witness volunteers from India, Japan, and Nepal in the construction of temporary shelters. 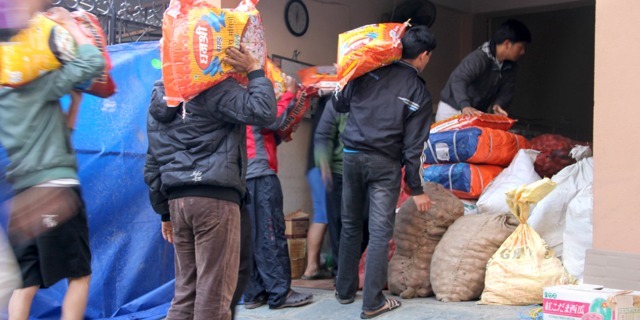 Volunteers from the Nepal office of Jehovah’s Witnesses store relief materials that have arrived from the Nepali city of Birgunj. A spokesman for Jehovah’s Witnesses in Nepal, Reuben Thapaliya, states: “We are concerned not only with the physical needs of the victims of this disaster but also with their spiritual well-being. Along with our efforts to supply food, water, and shelter, we have mobilized to provide pastoral support.” A representative from the world headquarters of Jehovah’s Witnesses, Gary Breaux, traveled through the affected region May 2-5, 2015, and visited congregations and individual families. On May 4, 2015, Mr. Breaux spoke during a special Bible-based program that was presented simultaneously via video streaming to other congregations in the region. Additionally, a representative of the Japan branch office of Jehovah’s Witnesses, Kenji Chichii, arrived on May 5, 2015. He also visited families in the area and gave encouraging, Bible-based talks. A representative from the world headquarters of Jehovah’s Witnesses, Gary Breaux (right), surveys the damage to one home. The branch office of Jehovah’s Witnesses in Germany assembled a medical team of Witnesses consisting of an anesthesiologist, a surgeon, a nurse, and a paramedic. 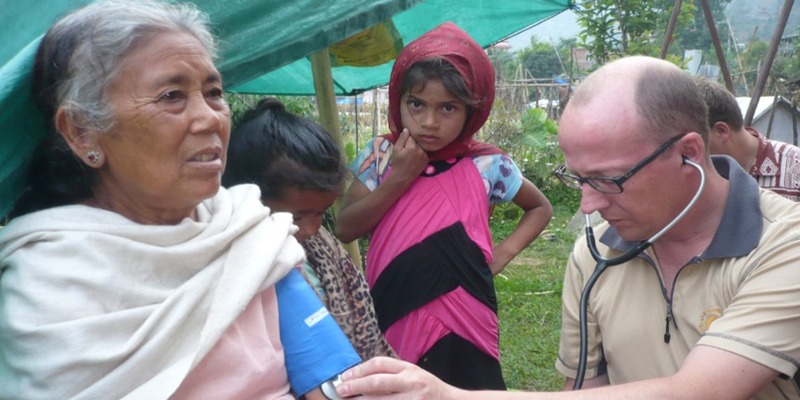 Equipped with medicine supplied by Witnesses in Bangladesh, India, and Japan, as well as mobile equipment for surgery and intensive care, this team from Europe worked with the Nepal Disaster Relief Committee to treat patients at Kingdom Halls in the earthquake zone. 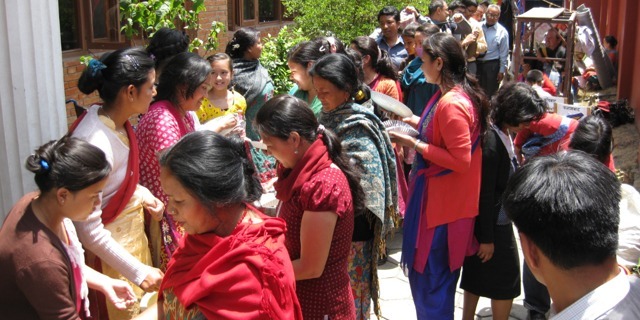 The relief team is based in a Kingdom Hall in Kathmandu where Witness victims are given food and shelter.